tammy robacker | writer No training required. Some banks make you sit up and beg to get their best checking interest rate. Not Commencement Bank. 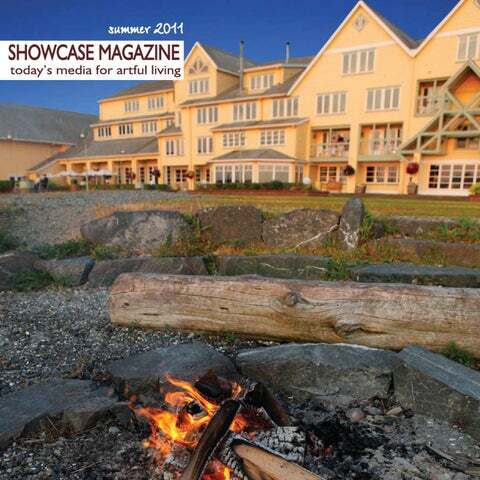 We are celebrating the threeyear anniversary of ShowCase Magazine. I feel thankful that you as a community have embraced us and helped us succeed beyond our expectations. We have had the pleasure of introducing you to an array of artists, community events, restaurants, designers, escapes and many other lifestyle features that have both inspired and helped each of us to learn a little more about the communities we call home. This issue is no different: Our cover story, Stay and Play at Semiahmoo, highlights the resort and all its seaside offerings. Discover why the state’s largest full-service resort is a getaway that will appeal to your entire family. Our cuisine section features new restaurants and old favorites. Whether you are an avid foodie or a novice, seeking something new to try or craving an old favorite, we share the local culinary highlights with you. Those of you with a green thumb will appreciate expert Melinda Myers’ tips to producing a beautiful garden while saving time. Finally, I want to take this opportunity to thank our readers and the communities and businesses that have supported us over the past three years. 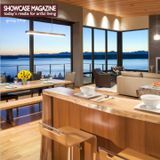 It has been a pleasure to connect with and serve all of you, and I look forward to bringing you many more years of ShowCase Magazine and ShowCase Media products. About Time, a fabulous shopping experience in historic Port Townsend. Creative clothing, shoes and accessories for the inspired woman and child. South Sounders convened for the 22nd Annual Capital Food and Wine Festival held at the Norman Worthington Conference Center at Saint Martinâ&#x20AC;&#x2122;s University in Lacey. Guests sampled cuisine, wine and micro brews from 60 local vendors. Music played throughout the event to accompany the festivities. Proceeds from the event provide support for the Saint Martinâ&#x20AC;&#x2122;s Alumni Association. >`Ê	ÃÌÀ Everything for your home, from our Courtyard Home! Quality antiques, rustic and weathered, old and new will delight shoppers. Over 70 dealers, create pleasing displays of home décor, furnishings, accessories, gifts and more! Courtyard Antique Mall, a unique shopping experience in Olympia! a place for poetry tacoma’s poet laureate program tammy robacker Influential American poet, Walt Whitman, could have been complimenting Tacoma when he wrote, “To have great poets there must be great audiences too.” It is here the solitary, personal art of writing poems has grown to become an entire city’s celebration of all things poetry by putting a bona fide Tacoma Poet Laureate program in place. What began as an Urban Grace Church’s brainchild to appoint a “spokes-poet” to better promote poetry in the local community in 2008 has evolved into a City-awarded role for a savvy Tacoma wordsmith. In an effort to keep expanding the program by seizing the opportunity to share the Poet Laureate’s talents and affecting a positive impact on the community, the Tacoma Arts Commission has teamed up with Urban Grace—now deemed the respected founding partner of the Poet Laureate program. Tacoma’s former Poet Laureates are writer and poet, Tammy Robacker (2010-2011): poet and professor, William Kupinse (2008-2009): and spoken word artist, Antonio Edwards, Jr. (2009-2010). The Tacoma Arts Commission selected Josie Emmons Turner as the 2011-2013 Poet Laureate for the City of Tacoma. Over the next two years, Emmons Turner will provide free poetry workshops, public readings, participate in Art at Work: Tacoma Arts month, held each November the honored poet will help produce the 2013 Tacoma Poet Laureate ceremony to announce the next Poet Laureate. This year de light in a bumper crop of vibrant activ ity at the ma rket. Contests, co oking demo â&#x20AC;&#x2122;s, garden tips, how-toâ&#x20AC;&#x2122;s an d hands on! Get the dirt â&#x20AC;&#x201D;right from our farmers. Check out ou r website O FTEN to be sure yo u donâ&#x20AC;&#x2122;t miss whatâ&#x20AC;&#x2122;s blooming at market! Salty air and spellbinding views entice you along your approach to Semiahmoo Resort, located on the end of a long finger-like island. The cottage-style resort sits on a wildlife preserve at the tip of a peninsula stretching into Puget Sound. Captivating views of snowcapped peaks, the Gulf Islands, Drayton Harbor and Semiahmoo Bay from the refuge. Once the site of a historic salmon-packing cannery, Semiahmoo was transformed into the state’s largest full-service resort in 1986. Apply a one to two inch layer of organic mulch on the soil surrounding your plants to conserve moisture, reduce weeds, and improve the soil. Youâ&#x20AC;&#x2122;ll spend less time and energy weeding, watering, and digging in the garden. When watering plants, do so thoroughly and less frequently to encourage deeply rooted, more drought-tolerant and pestresistant plants. Water early in the day to reduce water lost to evaporation. Also consider using drip irrigation to deliver water right to the plant roots where it is needed. Check container gardens daily and water thoroughly as needed. Mulch these to help reduce watering needs. And be careful when fertilizing these and your annual flower and vegetable gardens. Use a low nitrogen slow release fertilizer, like Milorganite, if the plants appear to need a nutrient boost. Summer has arrived and that means lots of fun activities and gardening opportunities to squeeze into this short season. Save time while creating beautiful results in your garden with these time saving techniques from gardening expert, author and TV host Melinda Myers. One Stop Wedding Shop ARE YOU READY FOR A HEALTH & FITNESS CHALLENGE? 5TH Avenue Fitness, a forerunner in the South Puget Sound �itness community and Progressive Body, Olympia’s premier personal training company team up to bring you to a new level in �itness! Regardless of your �itness level, our experts can help you SLIM DOWN AND SPRING INTO A MORE YOUTHFUL SUMMER BODY! Take the Challenge! Services: Detox program Nutrition plan by Designs for Health TRX Small Group Training Les Mills Group Fitness ZUMBA New! CX30, an intense core workout! Overall stronger levels of physical, physiological and mental health along with a �it, trim and younger YOU! How to reverse the aging process without hassle, pain, and sticker shock? To find out, we tapped experts across the South Sound to pin down the best ways to look younger. We sought out the most promising, and dipped into some of the scientific research, we spoke to clients who’ve had both good and bad experiences and played the guinea pig when necessary. The result is a list of eight easy, sustainable ways to reclaim vitality—something that is rightfully yours. Weddings are an exciting and joyful milestone event. However, they can also be stressful, involving months of planning hundreds of details, along with the typical pre-wedding jitters. As the celebrated honorees of this once-in-a-lifetime event, both the bride and groom will want to look and feel their best. Event benefits Point Defiance Zoo & Aquarium.